Once something becomes popular, it becomes expensive. I suppose we could attribute that to supply and demand, but it’s so damned annoying when it’s something that I like. That, and the innate desire to remain mysteriously cool by shunting popular culture becomes suddenly threatened. I hate when things deflate my ego. So it was that obscure beef cuts are experiencing a revival. I was once privy to this inner circle of carnal knowledge (pun), due to chance employment in a butcher shop. I wielded steel with all the finesse of a ballet dancer, partitioning select cuts in a choreographed display of sensual manual dexterity. The deft motions of my fingers as they expertly performed their precise maneuvers drew crowds of young women from the cashier’s station, to stare, transfixed with burgeoning lust at the perfected model of masculinity at work. And that’s how I met my wife. And that story is totally true, probably. If it happened the way I remember it anyway. But where was I? Ah yes, the super-secret knowledge of steak. 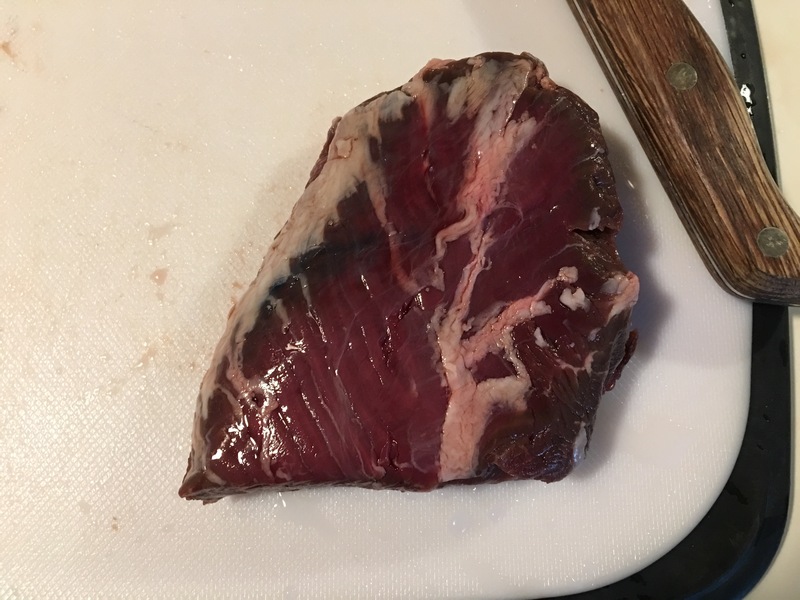 Of the more unusual cuts that the elder butchers would put out in the case, that no one ever bought because no one knew what they were, were the tri-tip and the parachute roast. As most meat ships from the slaughterhouses already partially sectioned, I never saw a whole steer. We would get regular shipments of half-steers, but never the whole. This is because it’d be terribly inefficient to butcher an entire steer without splitting it. I mention this because, in this process, a section of the diaphragm is lost. And in this section resided the elusive “butcher’s steak”, or the hanger steak. Yet since it was mentioned to me, and since I never saw one, it built in my mind a certain mystique. One day, I would try one. Since those days, numerous articles had popped up extolling the taste and value of such underrated cuts. The hanger steak was among them, and so with the forgotten now being popular knowledge, the mystique died. Then we visited Dayton’s 2nd Street Market, and a stand (locally-sourced beef) was selling them. $10 a pound was probably too much, but I had to honor a past promise to myself. So I bought it. And as is with the allure of waiting for anything, the hype surpassed the experience, though it was not disappointing. To sum it up, the steak was as tender as any rib/loin cut, although it lacked the fatty flavor of the latter. But, it had a good beefy flavor despite the lack of marbling. I would choose it over anything off the chuck and sirloin, but had I the choice, I’d choose the ribeye. So if you find one, as long as it’s cheaper than a N.Y. strip, it’s worth the cost. And if you’re good, cutting out that center strip of silver might draw the lustful gaze of your lady. Poppy just wants a friend, but Faye is old and hurting and dying. Consequently, she does not appreciate being bitten by an instigating youngin. 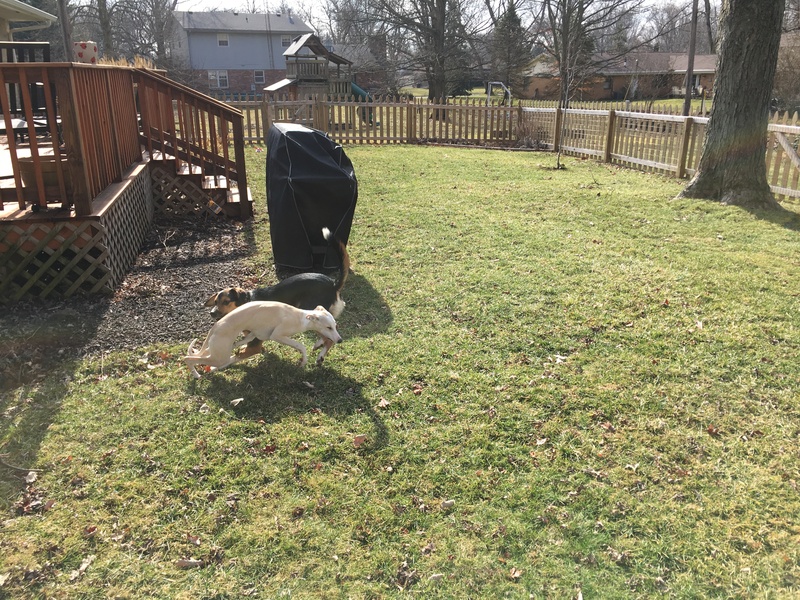 Fortunately, the neighbors have their little hound who is causing the same problems amongst their pack. So we combined the two into a furry vortex. I made it one year! 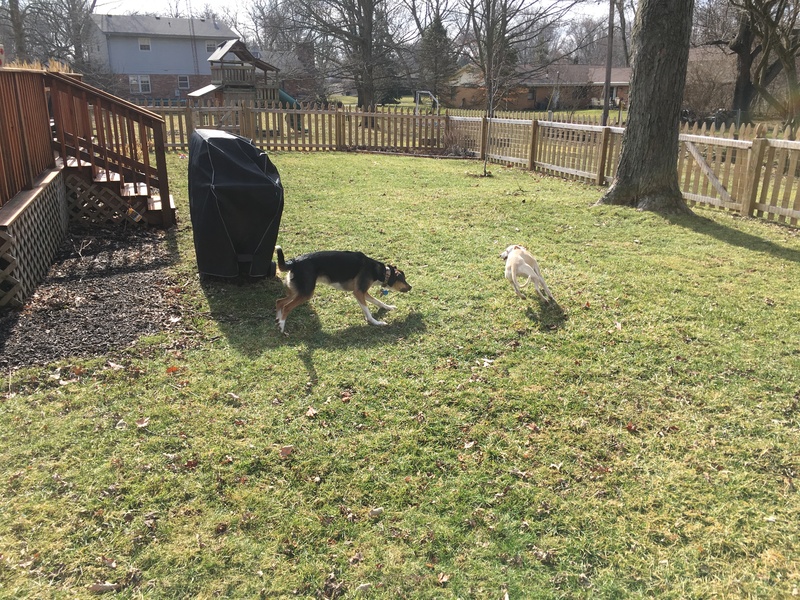 I consider the WordPress experiment a success. This story begins with a remote-controlled centipede. And how many stories have that preface? Yet it’s true. My mother’s boyfriend (Roger) is a big kid at heart. And to me, that’s very relatable. I too seek excuses to wander the Nerf isle, chuckling merrily at the myriad of mischievous machinations–made by malicious Man. How I long to fork over the $150 for the battery-powered chain-fed fully automatic Nerf LMG. And I totally would, were I to have a son instead of a daughter. But Roger’s sense of humor provides the excuse, and I find myself buying him the toys that I secretly want for myself. And he in turn does the same to me. And so, I found myself with a really cool remote-controlled centipede. I collect electrical cords. Sure, proprietary monitor ports have given way to VGA, then to DVI, then to HDMI; but what of those old and still-functioning peripherals? They might be re-purposed one day, and then where will I find one of those old cables? So I keep them all, in a cardboard box, in which they’ve amalgamated into some form of insulated copper Gordian Knot, but I know that the moment I throw one out, I’ll need it. And despite Liz’s protestations to what she considers “hoarding”, the box remains. The centipede has an internal battery which cannot be swapped. I find that unusual for a toy. And equally unusual is that the toy did not come with a charging cable, given the clearly-labeled charging port on the centipede’s ventral service. It was a situation of little importance given the far more demanding obligations at hand, but it irritated me. And so, I dove into the box, looking for a cable–any cable–which might fit the connecting port on the centipede’s underbelly. And found a cord I did, much to my surprise. Yet, the cord’s other end was USB, which made me really wonder what it’s original purpose was. No matter, what I needed then was an adapter. But then I considered–how many different charging cables terminated in USB? To answer, I dug through the box some more. I found (before I grew weary of knots): USB micro, USB mini, and the unknown and aforementioned centipede charger. I considered: wouldn’t it be nice if I could plug them all into something akin to a charging station? And then I found the old USB hub, which was powered. Huzzah! 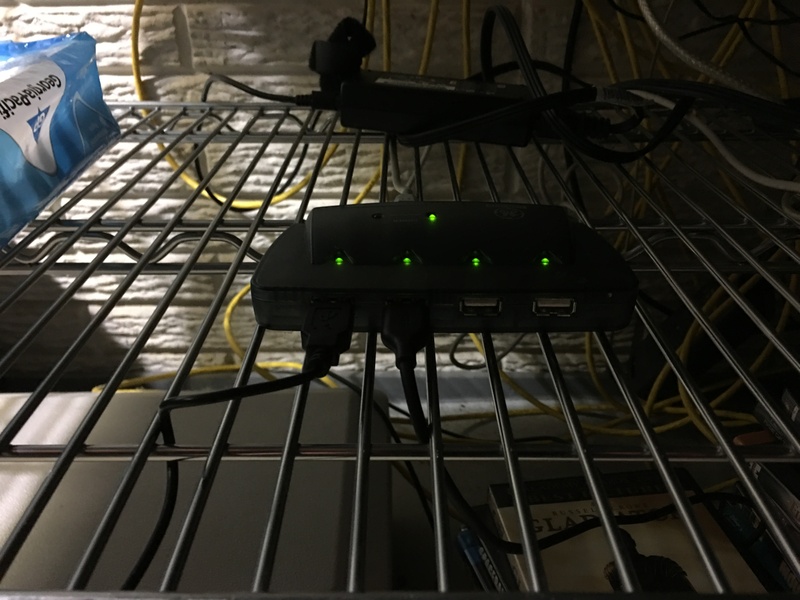 I plugged the hub into an outlet, then the various cables into the hub (including the centipede-charger). And sure enough, the centipede indicated successful charging via glowing eyes. 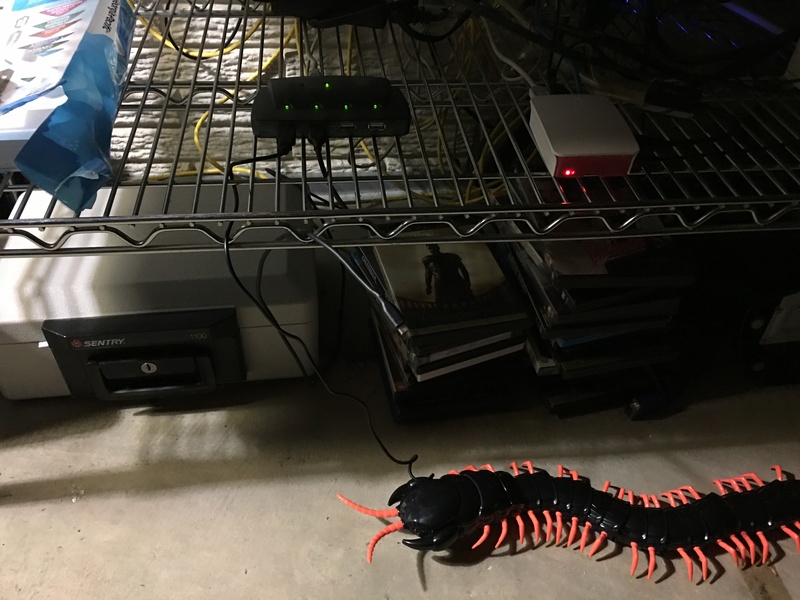 And now, I can plug additional devices into the hub to charge alongside the centipede. So what started as a very insignificant dilemma turned into a more expansive solution. I now have a charging station on the tech shelf for any modern electronic which might need a battery charge. And they’ll all have a centipede guardian. I sit here, typing on an HP Pavilion…running Ubuntu Linux! That’s very exciting for me, although I’ve come to understand that the accomplishment isn’t so nearly as grandiose as I had predicted. Still, it’s a happy accomplishment. This computer was a necessary replacement. 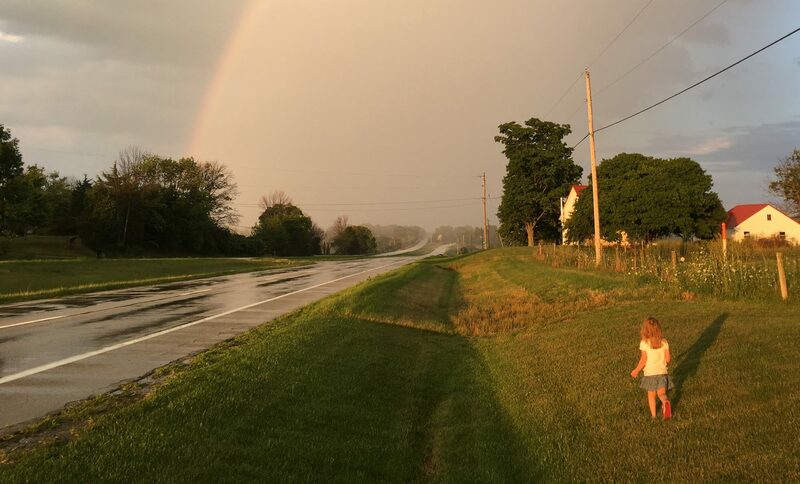 Liz’s VAIO–her college computer–had died a quiet and dignified death through inevitable hardware failure. Afterwards, she used my iMac G4–my college computer. Eventually, that too died. For obvious reasons we needed a computer, and since I was unable to justify the cost of a new mac (my own preference), and since Liz hated macs, we decided upon the HP laptop (since our apartment had a certain lack of space for a permanent desktop setup, as the computer room had been converted into a nursery). 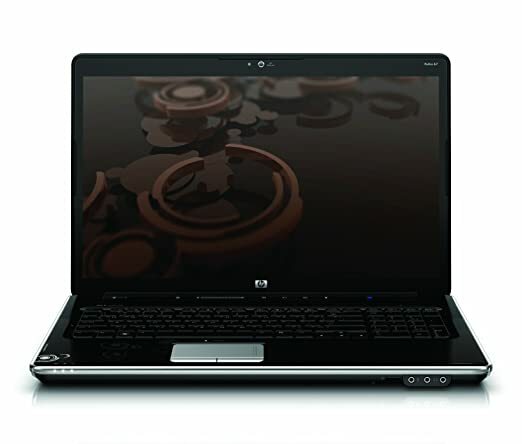 Still, we opted for something with higher-end hardware, thus the HP (dv-3186cl)–an i5 quad-core 2.27 GHz with 4 gigs of RAM. It was, and still is, a respectable computing system. This machine served us well for years, but eventually it too succumbed to the ravages of time. The hard drive had started to wear out, the OS (Windows 7), had become increasingly bloated (the inevitable fate of evolving OSes), the battery (which we had replaced multiple times) died, and the WiFi card ceased to function. Upon this last failure, I lost my patience and bought a MacBook Pro. It had been years since I enjoyed Apple’s OS, and I was elated at the homecoming. Liz limped along with the HP, until one day it refused to cooperate at all. And as she needed it for work, she immediately replaced it (with a newer iteration of HP’s Pavilion series). 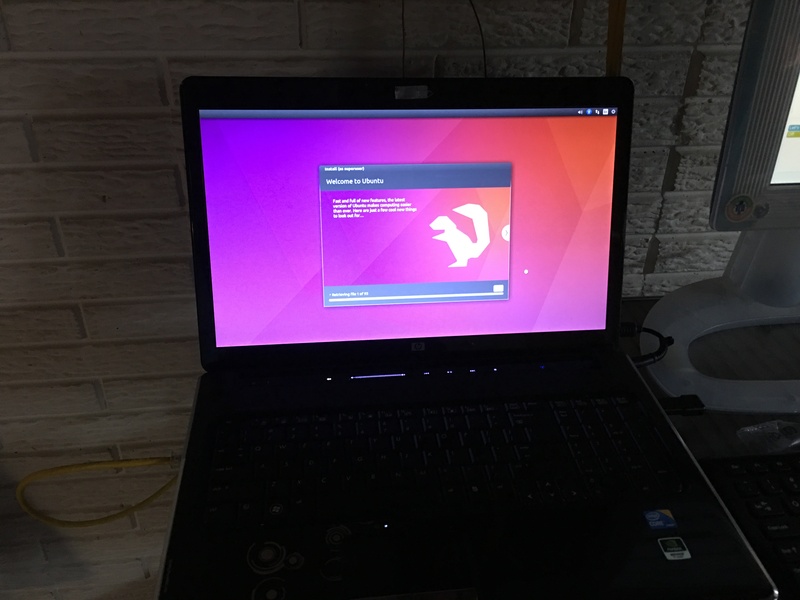 I, being ever-loath to discard technology, retired the broken machine to the mothyard (the basement), with the vague plan of replacing its defective hardware parts one day, and installing Linux. Then I received some Amazon gift cards and decided that was the necessary excuse to begin. I hooked it up (it had no battery) and pressed the power button. And it promptly informed me that the WiFi card was inoperable. I disregarded the warning, and was then informed that the drive was likely to experience imminent failure. I ignored this message too (all the data had been backed up anyway), and continued. Rather, I tried to continue, but was then informed that the drive failed to mount. Again, no biggie. This was just a test to see if the hardware would function at all. Perhaps the drive was fine, but the OS had become corrupted. So I began my search for a Linux distro. My first hands-on experience with Linux was openSUSE, years ago when I had managed to install it on an old beige G3 powermac. At the time, I had it configured to be a simple Apache web server, and it had performed its duties as a platform for my first-ever blog: intellectualnexus.net. I’m happy to see that the domain lies unregistered currently. Apparently no one else has since thought to use the name. I ultimately agreed to discard that derelict machine once the kid arrived, and I had been without a web server since (until I bought my Synology). Then my sister bought me a Raspberry Pi. The Pi came with its fork of Debian, NOOBS. That was my second experience using Linux. The Pi has lived an off-and-on existence, primary simply to serve an omni-present web page (currently a Google calendar). In both of these examples, my familiarity with Linux had been minimal, and my hand-on experiences to be lacking in confidence. But Linux had changed since my earliest experiences, and the Internet was confident that contemporary distros were rivals in usability to the other major OS players. In fact, I had even stumbled across Dell’s product listings that included machines with Ubuntu pre-installations. I hadn’t much cared for SUSE at the time, and with Debian appearing rather minimalist, I took Dell’s endorsement of Ubuntu and searched for a package. It didn’t take long to find. It turned out that Ubuntu has very comprehensive guides for downloading and installing. They even provided a step-by-step guide for my exact scenario: downloading the installation iso onto a USB flash drive with a Mac. With this amount of helpful documentation, Ubuntu made a good option. I picked up a USB stick on the way home from work the next day. That night, I followed the instructions to the letter, and quickly ended up with a usable USB install drive. I plugged it into the HP and booted up, and after ignoring the error message regarding the WiFi and failing HD, entered into the install prompts. 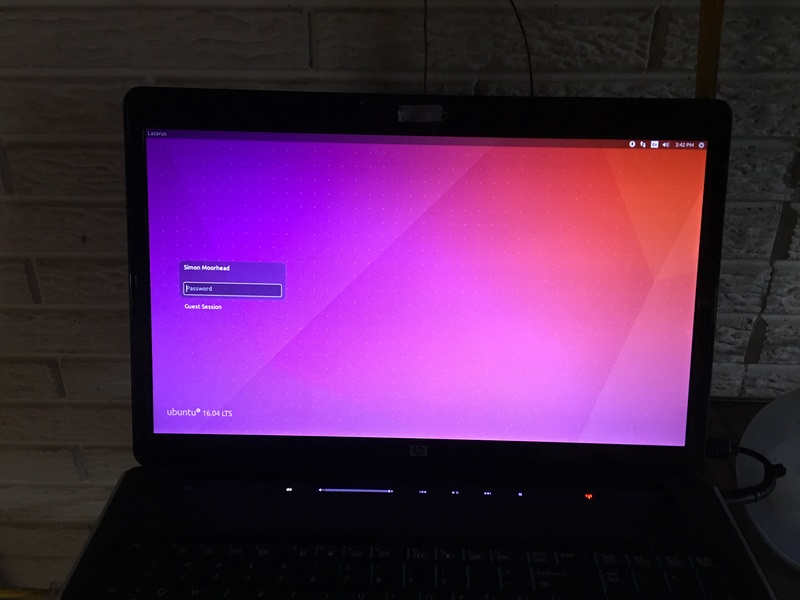 This, too, was straightforward, and after the installation completed, I rebooted, hoping to see Ubuntu’s happy welcome screen. But instead I was met with a new error, and this time the HD was completely inaccessible. So despite my misgivings that the drive was okay and Windows was to blame, the hardware was indeed at fault. I bought a 1TB HD off Amazon and waited the two days for shipping. 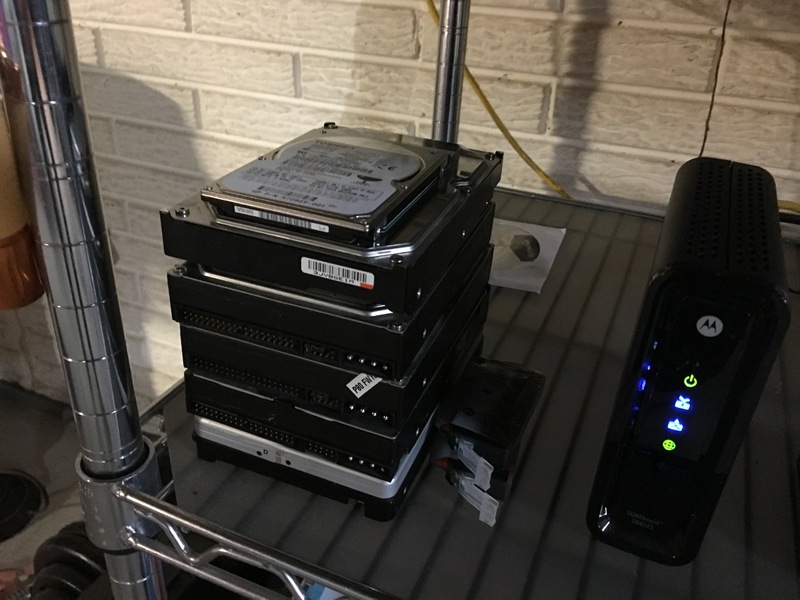 The old drive, now undoubtedly defunct, was removed and relegated to the mothyard’s stack of inoperable/obsolete hard drives. What am I going to do with an 80GB PATA? The drive installed easily enough and I re-ran the installation (once again ignoring the WiFi error (vowing to discover how to turn that message off in the BIOS later)). The install completed much quicker this time. Apparently a functioning hard drive was the key factor. I also paid more attention to what the installation was doing, and was pleasantly surprised to see that it was automatically deciding upon the appropriate drivers for the detected hardware and removing those that weren’t relevant. In short order, upon reboot, I was greeted with the happy welcome screen which for which I had eagerly awaited. I signed in and began poking around. The default installation included the basic applications necessary to navigate a file system and the Internet. I triggered a mass application update to get the most recent versions, then poked around in the package center (or whatever they call it). There were similarities between Synology’s Linux fork and Apple’s OS (a freeBSD fork), so it’s been relatively straightforward to figure out. Ultimately, I had just planned to use the HP as a web browser (courtesy of Firefox) and a coding platform (now using Notepadqq). And it’s fulfilled these expectations. It’s also exceeded them. The OS is incredibly efficient, and has proven to be the fastest system I have used to date. And after discovering that a sticker had melted onto the internal WiFi card, and removing said sticker fixed it, I’ve decided to order a battery and have a completely restored workstation. I don’t know if it’ll turn out to be my primary machine, but it’ll certainly fill a niche where more technical tasks are involved. 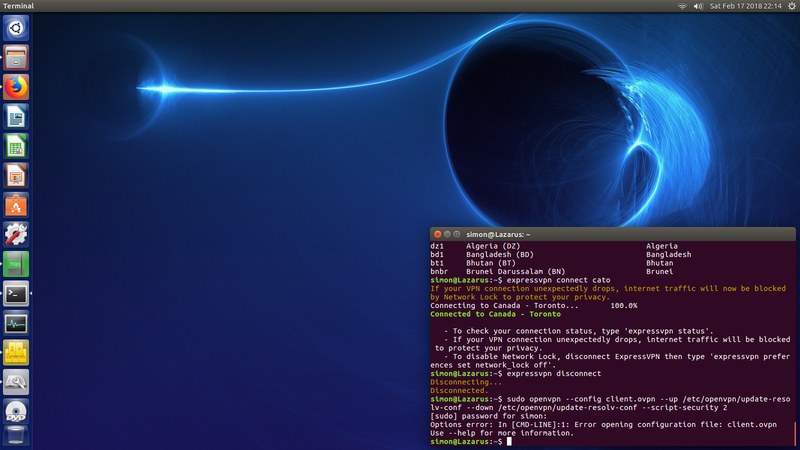 So far, Ubuntu has excelled beyond my every expectation. I offer my personal endorsement.